While Moore’s Law has guided projections for processing speed over the last few decades, expectations for exponential growth might be a little light according to futurist Ray Kurzweil who wrote in 2001 that, “We won’t experience 100 years of progress in the 21st century — it will be more like 20,000 years of progress (at today’s rate).” Of course his “Law of Accelerating Returns” refers to evolutionary systems in general. In Q1 2012 Logic Supply introduced the AG150 as a fanless workhorse that was to become the company’s best selling system and, in its own right, iconic. Initially this system was engineered around Intel’s fabled Marshalltown motherboard. Known for its slim skyline, the Marshaltown was also known for an early end to its lifecycle, see The End of an Era. Logic Supply quickly went to work to keep the popular AG150 alive. The long term result was a line of succession that continues to this day, with AG150 users consistently impressed with the performance of these powerful but compact systems. Far ahead of the planned EOL for the AG150 (Q1 ‘17) the latest successor has been brought to life using Mitac’s PD10BI motherboard. But due to Logic Supply’s focus on innovation, evolution continues; the new puppy is comparable only by the I/O set and the thin skyline. Logic Supply’s latest system, dubbed the ML210G-10, combines a hardened industrial enclosure with powerful Intel Bay Trail processing to achieve a size to performance ratio virtually unmatched in the industry. Featuring an Intel Bay Trail Celeron J1900 processor capable of easily accommodating HD graphics and other processor-intensive applications, the ML210G-10 draws less than 20W of power, offering a highly energy-efficient alternative to traditional tower PCs and even other power-hungry thin client solutions. The ML210G-10 features support for Windows 7 and Windows 8 in both 32 and 64-bit flavors, as well as Linux Ubuntu 14.04 LTS 64-bit. The selection of included I/O was designed to accommodate the widest possible range of embedded systems and devices. 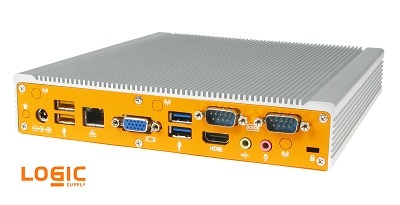 Onboard connections include 4 USB ports (2 of which are High Current), 2 RS-232 COM ports, VGA, HDMI and LAN. The system supports up to 8GB of RAM and features an operating temperature range of 0°C~50°C. So while it is understandable to associate phrases like “out with the old-in with the new” as technologies evolve, the AG150 isn’t going anywhere just because there’s a hot new model in town. However if progress in technology follows other evolutionary systems, we expect to see the ML210G-10 move quickly to the head of the herd as the new go-to fanless industrial computer. We’re launching this platform with a certain sense of pride and accomplishment. We’re ahead of the game with the ML210G-10, but since innovation is in our blood and we’re already looking to the future, we’ll be keeping tabs on migration patterns.